Typically, for most parents, back-to-school time gets very busy. Your schedule tends to get full with after-school activities and other extracurricular activities that your children enroll. With an increase in scheduled activities, that means there's not as much time to complete the needed maintenance on your vehicle. 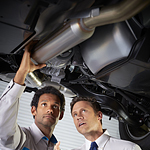 By being proactive with vehicle maintenance, such as an oil change, brake service, coolant fluid checks, and tire rotations, you will be much better prepared throughout the school year. Additionally, you want to check your wiper blades, headlamps and taillamps to make sure they're in good condition, for your safety and others. Remember to also check your emergency roadside kit for all of the essential items! Lion Country Kia's service center in State College has qualified technicians to handle all of your vehicle maintenance needs. Give us a call or schedule an appointment online. We're here to help you make the school year a success!